The history of the beer brewing industry in Australia has been the subject of several books in recent decades. Most, however, were corporate histories, each concerned with a particular company or family of companies, so were of a celebratory or self-congratulatory type. It remained for a monograph to appear which dealt in a systematic and scholarly way with the brewing industry of the whole of Australia, or even of a single state. This omission has now been rectified with the publication of Beer, Mines and Rails, by Dr Brett J. Stubbs, Australia’s leading historian of beer and breweries. This meticulously researched, copiously illustrated and comprehensively indexed work deals with the emergence of brewing in mid-nineteenth century Queensland; with the rapid spread of breweries throughout the colony to their maximum geographical range around the end of that century; and with the contraction of the industry to Brisbane, the capital city, by the 1920s. In Queensland, as in the other Australian colonies, the development of the brewing industry was directly stimulated by mining—especially for gold—and by the construction of the railway network. Mining and railways and their relationship to the making and consumption of beer are therefore continuous themes throughout this history, as reflected in its title. The arrangement of the book, however, is geographical, with separate chapters covering the breweries of Brisbane and the southern, central and northern districts of the state. 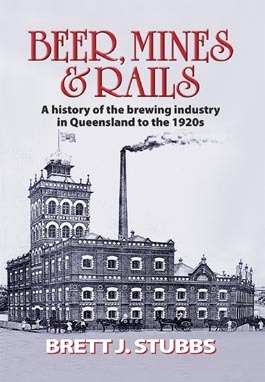 It is essential reading for anyone with a desire to know more about the history of the important industry of brewing, but will also appeal to those with a more general interest in the history of Queensland.